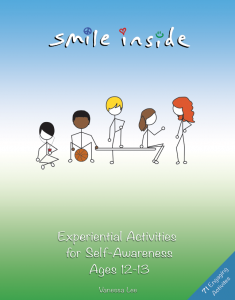 Essential character education activities for anyone who works with youth, these social and emotional learning activities facilitate the development of self-awareness, resilience, and responsibility. During the middle years, young people benefit from developing self-awareness about their feelings, thinking, and behavior. This resource for ages twelve and thirteen provides a comprehensive social and emotional learning curriculum that will prepare them for the challenges of adolescence. In addition, select modules and activities can be used as prevention and intervention programs to counteract specific issues of bullying, self-destructive behaviors, social isolation, and apathy. This practical handbook contains seventy-one valuable and fun activities with step-by-step instructions for teachers, youth workers, and counselors who work in schools, youth groups, and at camps. The following modules are explored: Icebreakers, Focus & Listening, Empathy & Respect, Self-Talk, Self-Exploration, Emotions & Coping, Problem Solving & Decision Making, Goal Setting, Group Dynamics, Esprit de Corps through Service Learning, and Culmination. • Replace bullying and exclusion with group bonding. • Facilitate the development of empathy, self-awareness, and emotional intelligence through interactive and introspective activities. • Use the activities as needed or allow each module to build upon the last by using the book in its entirety as a prevention program. • This companion handbook with the same modules, contains 65 valuable and fun activities with step-by-step instructions for teachers, youth workers, and counselors who work in schools, youth groups, and at camps. 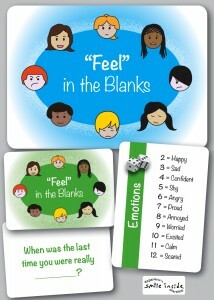 “Feel” in the Blanks™ is a game that uses question cards, a list of emotions, and dice to facilitate social and emotional learning in children. The game enhances emotional literacy by asking players to reflect on feelings and share with others. This activity is highly effective for small group work because it encourages exploration and expression of emotions in an interactive and fun format. “Feel” in the Blanks™ comes in a plastic deck box with multi-colored dice. This product is now available at the Northside Marketplace and on Amazon. Sign up for Smile Inside’s newsletter if you wish to be notified about other Smile Inside products, services or workshops. As a school counselor, I am always looking for new tools and resources to help students open up about their emotions and experiences. I have used ”Feel” in the Blanks with individual students as well as in a group and it is a great way to start building connections and rapport with students. I’ve found that even the students who are more reserved will open up with the prompts in the game. It was wonderful to provide a comfortable way for students to open up and connect. I will definitely keep this activity in my office as a resource. I wanted to thank you so much for introducing this “game” to us. I refer to it as a game only because, for the kids, it was. It’s clever and fun and without realizing it, they began to open up about feelings, situations and questions and share them in a safe place. For us parents, it opened up a new door of communication and a chance to hear our girls in a way they were able to explain. With three elementary aged girls, each with very different personalities, likes, dislikes, fears and strengths, one child with ADHD and extreme highs and lows emotionally, this gives us a non competitive way to talk, learn and express ourselves and not only did we as parents learn but it was amazing to watch each sister embrace and gain respect for each other. We have taken this to other family game nights and it’s been wonderful and requested that we bring it along. It’s fun, fast pace, easy for all ages…. love this. It is such a great non-intrusive way to have a conversation with the kids about what they are experiencing. I enjoyed that the game gave me the opportunity to hear my daughters as well as her peers thought processes and feelings on a variety of situations. This game had a group of kids aged 5-13 engaged on a multi-family camping trip. It spurred some great conversations! The game is perfect for long car rides! It’s the best game ever. I like it. It’s like a get-to-know-you game you can play with new friends so you can understand each other’s emotions better. “Feel” in the Blanks is great! We like this interesting concept, it helps start a conversation about articulating feelings without being offensive or rude. Easy to play, Arabella sometimes initiates the game! My daughter and I were visiting Cuyahoga Falls from Oshkosh, WI and came upon your game at Kids Fest in downtown CF. My daughter is 7 and LOVES this. Asks to play it nearly daily. Makes her really think about her feelings and reactions to situations. Thank you! I am delighted to know how helpful this has been for my granddaughter, as this year she has been experiencing the effects of her parents’ divorce, and moving into two new homes. Thank you for creating such a wonderful tool! An individual’s ability to be motivated and to learn is hindered if their mind is preoccupied with problems, concerns, or anxieties. Failing to attend to these issues as a part of the educational process is counter-productive. Self-esteem is built upon a series of small successes that eventually lead to greater achievements. This leads to a self-sustaining sense of self worth. However, not all individuals require increased self-esteem. Someone with an authentic sense of self, social skills, and resilience is likely to continue to seek knowledge and will find success in all aspects of life. It is essential for youth to develop values, morals, empathy, as well as coping and problem-solving skills. If you give a child a thought, you prepare him for a day. If you teach a child how to think, you prepare him for a lifetime. If young people can strengthen their conviction to be true to themselves throughout life, they are less likely to be affected by unhealthy influences and less tempted to make a wrong turn on their journeys. Mastering their minds and behavior and coming to a deeper understanding of their relationship to others and the world is the foundation for sound mental health. 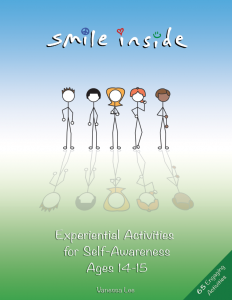 Smile Inside offers self-awareness activities, social and emotional learning activities, and character education activities to engage and inspire the learner on their journey to adulthood.